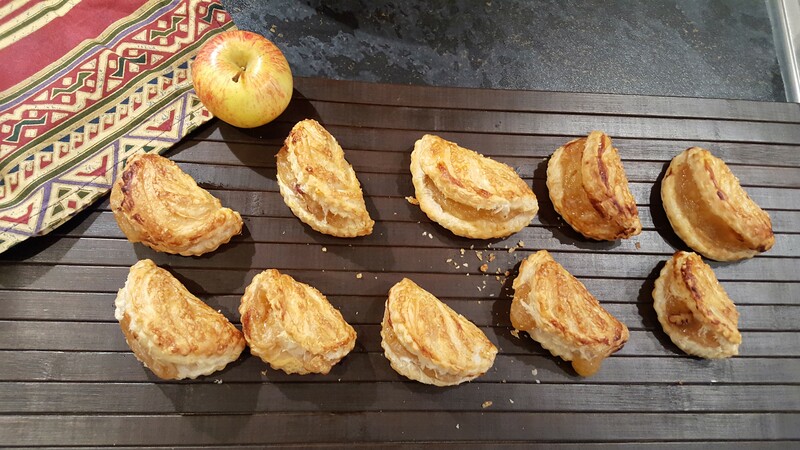 These flaky “Chausson aux Pommes” – Apple Turnovers are so delicious and so easy to make. 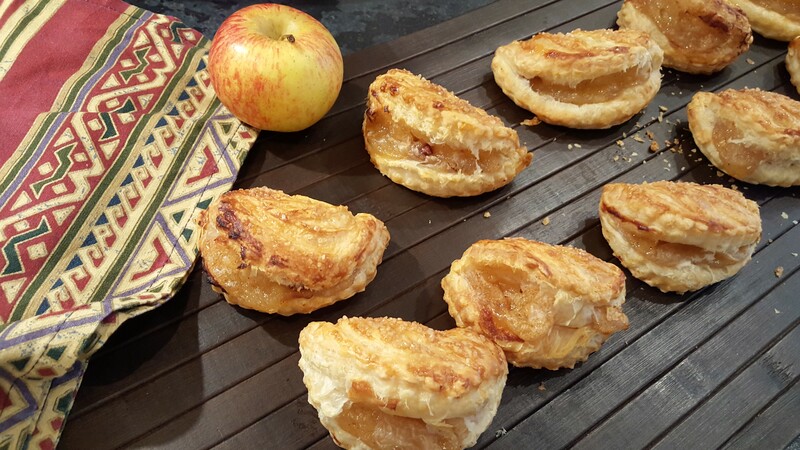 Few ingredients, fresh apple with added aroma of cardamom, flaky puff pastry is all you need to create these melt-in-the mouth bites. 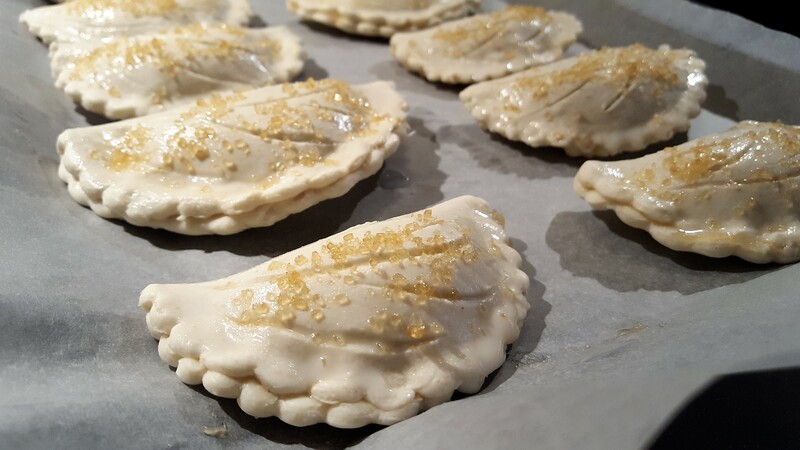 I have been longing to make these “Chausson aux Pommes” – Apple Turnover for a while, and there is no better time than now. Apple in season and in abundance so why not?? And quite honestly I could not resist but to makes these. 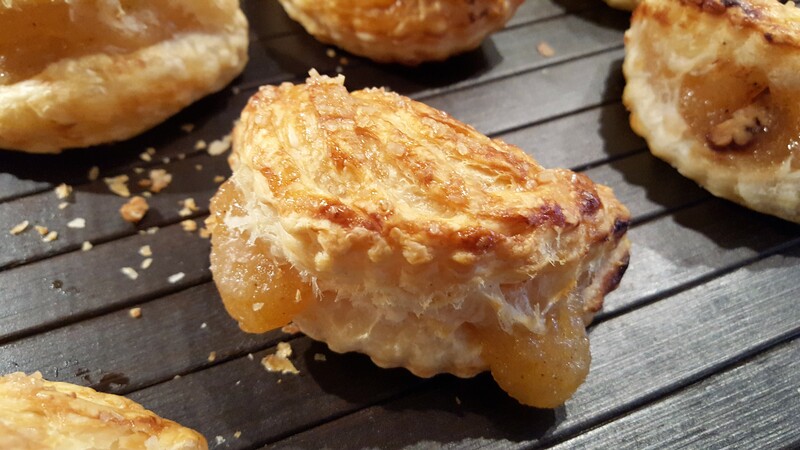 Imagine freshly baked “Chausson aux Pommes” in the morning, buttery, fresh taste, homemade. As for me I would easily eat these anytime of the day. 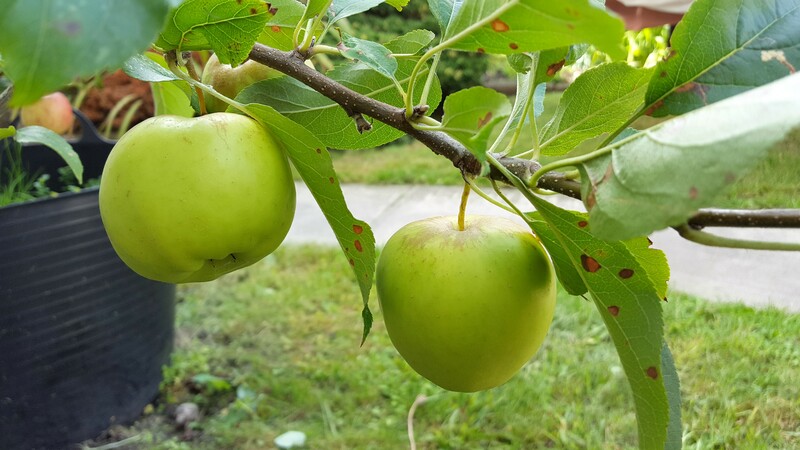 In this recipe I have used both eating apple and cooking apple – the proof will be in the tasting. 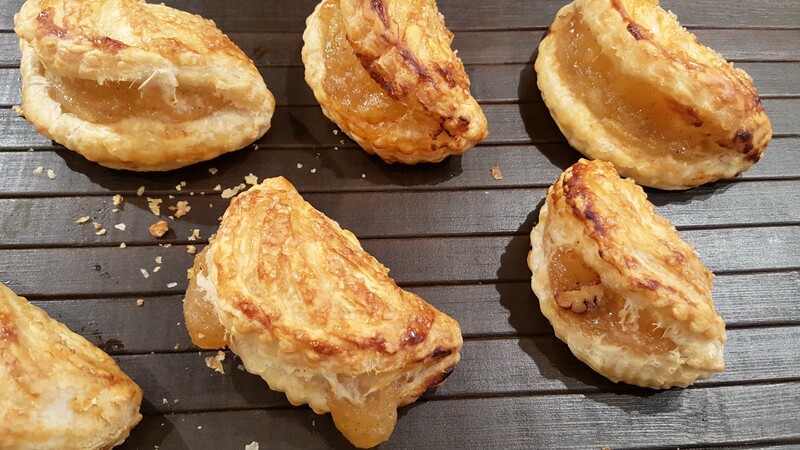 You can prepare these and freeze them, bake as and when you fancy some warm homemade pastries. I have used readymade pastry, quite honestly I don’t have any guilty feelings in doing so. 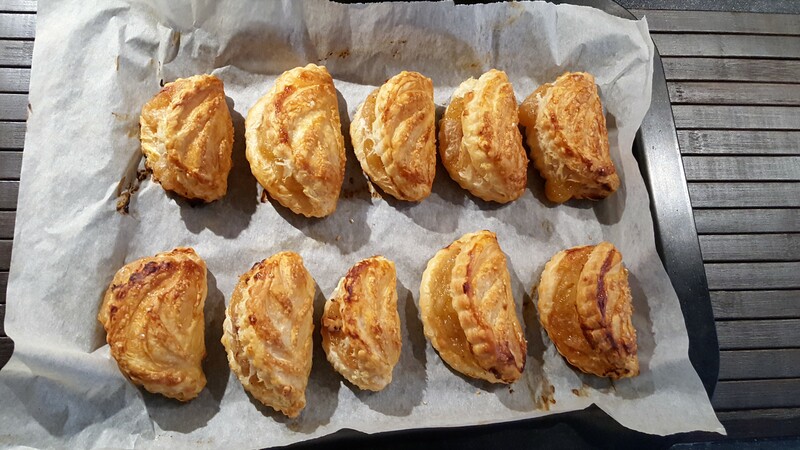 My excuse not to make them is that I prefer not knowing how much butter goes into making these delicious buttery pastries…I guess that a good excuse ….haaaa what can I say!!!! These days one can get good quality readymade pastry in most supermarkets, so save time and energy. To Note: The cooked apple will freeze well too, put in little containers and use them as and when you wish. Start by preparing the apple, place the diced apple in a medium saucepan over medium heat, cinnamon, and sugar. Cook for about 5-10 minutes until the apple starts to soften. Stir in order to prevent the apple from sticking to the pan. Slowly cook/simmer until most of the moisture has evaporated. Remove from heat and allow to cool completely. Place the place on floured surface, roll out. Using a pastry cutter cut into shape. Spoon the cooled cooked apple in the middle of each disk leaving the edges free. Turn over to cover forming a half moon. 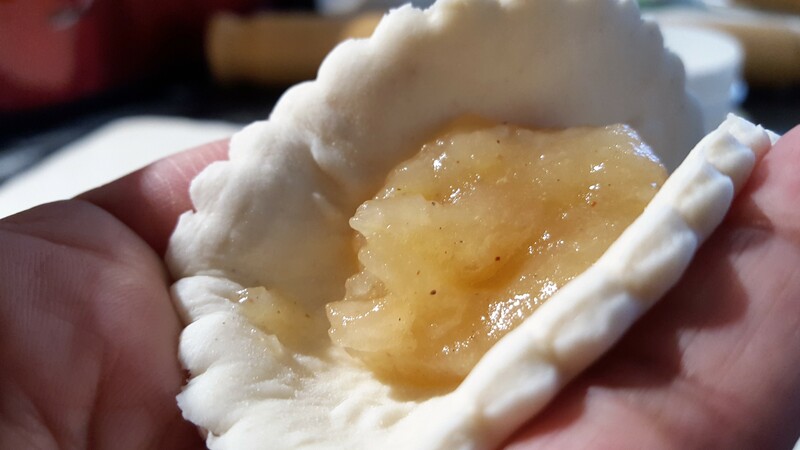 With the tips of your fingers gently seal the edges to encase the apple filling. Place on a lined tray keeping them apart as seem below. Using a small knife score the top forming a design, taking care not to cut too deep into the pastry. 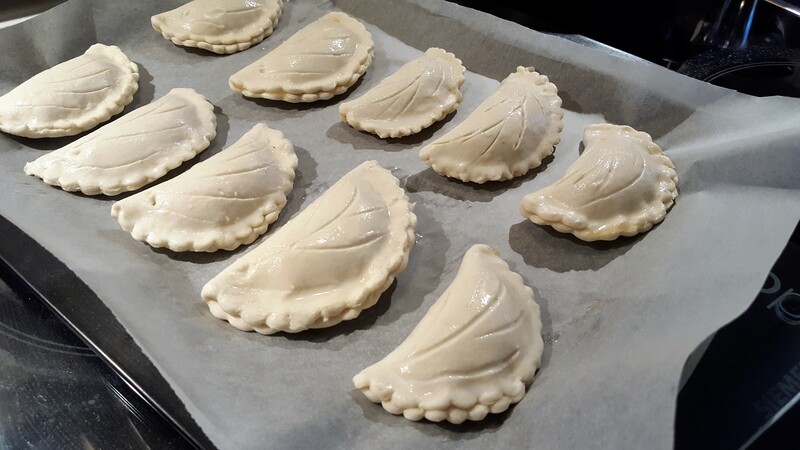 Lightly brush the top of each turnover with beaten egg or milk then bake in a preheated oven 200 degrees C for 20 minutes until golden brown. Half way through the baking, I suggest you rotate the baking tray to ensure even baking and browning of the pastry. Remove from the oven place on a cooling rack. 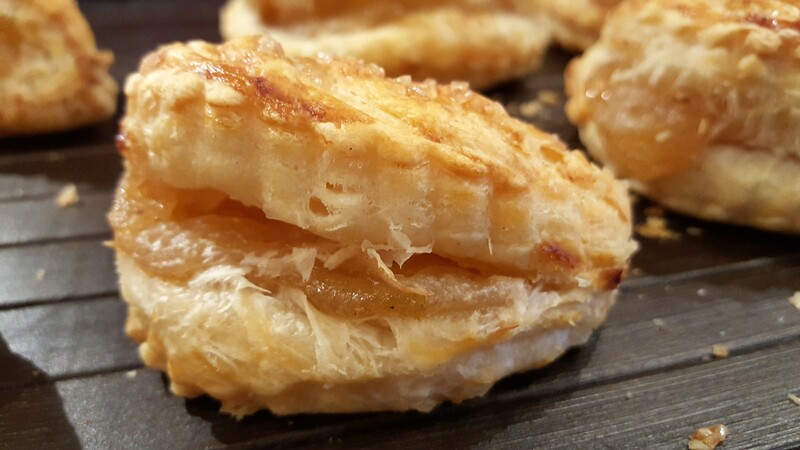 Best to eat while warm to enjoy the buttery flaky bites. 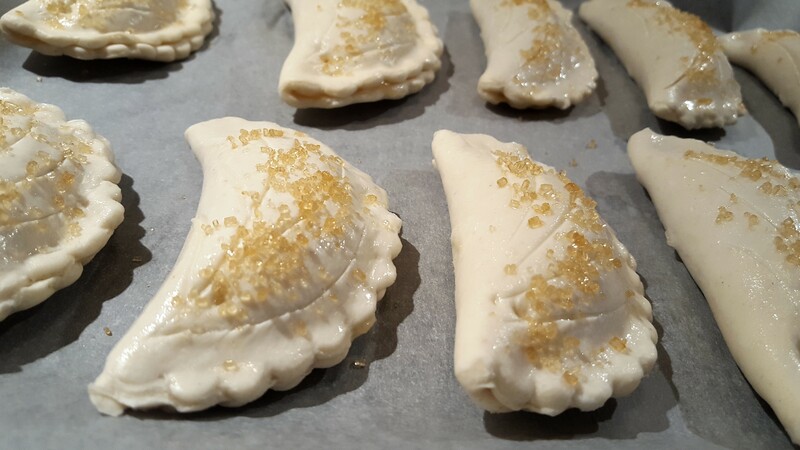 Brinda’s Note: If using fresh pastry you can prepare them and freeze them in batches, take out and bake from frozen. The baking might take a little longer depending on your oven.